Amazon has banned sales of Apple and Google video streaming devices that aren't compatible with its own service. The online retail giant sent an e-mail to its marketplace sellers that it will stop selling Apple TV and Google's Chromecast. Amazon recently unveiled its new Fire TV (pictured) and $50 tablet amid of slew of new products. No new listings for the products will be allowed and posting of existing inventory will be removed Oct. 29, Amazon said. Roku's hardware, Microsoft Corp.'s Xbox, and Sony Corp.'s PlayStation, which work with Amazon's video service, aren't affected, Amazon said. Earlier this month Amazon unveiled an upgraded Fire TV 4K media box for $100 (£80) and a new Fire TV Stick with voice remote for $50 (£45 in the UK). 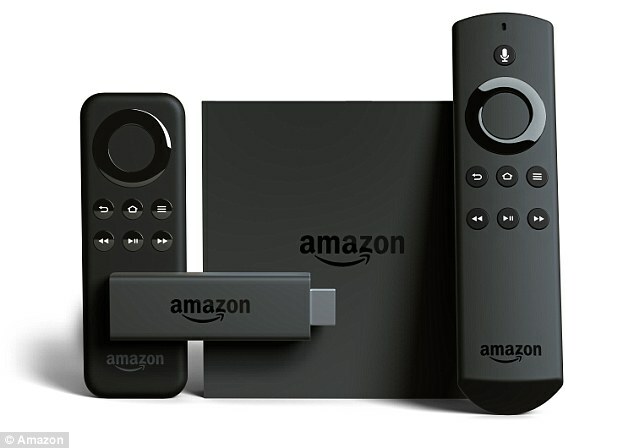 Amazon’s Fire TV stick, which plugs into an HDMI port to connect televisions with streaming services such as Netflix and Prime Video, is the company’s best-selling electronic device. 'Since we launched Amazon Fire TV last year, gaming has been a customer-favorite,' said Amazon vice president Peter Larsen. The fourth-generation TV box was unveiled at the Bill Graham Civic Auditorium in California during Apple's fall launch event. 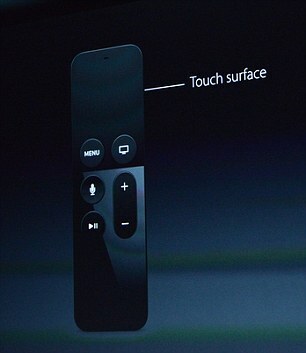 Its new remote has a glass-touch surface that lets viewers control menus with their fingers. It additionally features a 'Siri' button that lets viewers search using just their voice. All of the screens have been redesigned to 'focus on the content' and Siri will search across every app - including Netflix, iTunes, HBO, Showtime and Hulu - to find content. Other Siri features include the ability to find exact clips within episodes and the option to skip back and show dialogue that was missed. While watching a film or TV show, swiping down on the touch surface will present a menu of information about actors, for example. Viewers can also ask Siri questions about a show, or ask for scores or about the weather, and the answers appear on the screen. Turning the remote on its side transforms it into a games controller, and iOS games have been adapted to work on the larger screen. TV OS even offers multiplayer functions on compatible apps, such as Crossy Road. Prices start at $149 for 32GB and $199 for a 64GB device and both go on sale in October. Amazon took a $170 million write down in the third quarter last year after it struggled to sell its inventory of $200 Fire smartphones. Amazon has said it does not plan to profit from devices but to drive more customers to services through the gadgets. It comes a day after Google unveiled a new version of its $35 Chromecast TV dongle, and hit out at Apple's TV plans and touch remote. 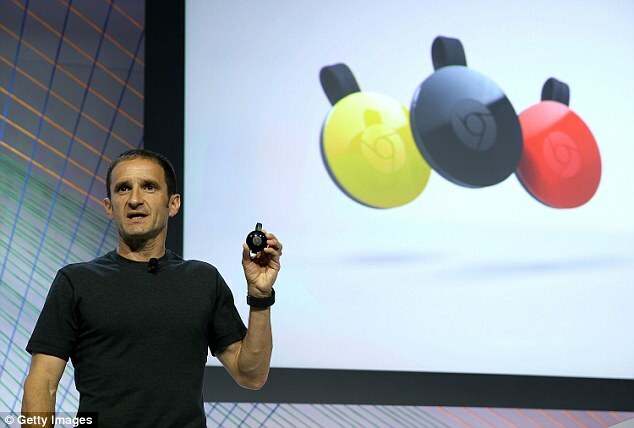 'Chromecast allows you to bring apps to the TV by extending the apps of your phone,' said Mario Quierioz of Google. 'The phone becomes your best remote. Amazon is also testing an Uber-like service for delivering its one-hour Prime Now packages that will enlist people to deliver packages for Amazon with their own cars. In order to offer the speedy deliveries Amazon will pay drivers $18 to $25 an hour via its new Amazon Flex program. The move comes before the bustlingly busy November and December holiday shopping period. Amazon has been expanding its Prime Now service for members of its $99 annual Prime loyalty program. The service delivers a wide range of items including paper towels, wine and beer (in Seattle only), chilled and frozen items like milk and ice cream and televisions and Kindle device in one or two hours. Two-hour delivery is free and one-hour delivery is available for $7.99. It now offers Prime Now in 11 cities with across the country with plans to roll out to more.